The 2011 Proof Silver Eagle marks the continuation of a series of collectible silver coins from the United States Mint that dates back to 1986. These coins were initially released to the public beginning on June 30, 2011 for $59.95 with a household order limit of 100 initially in place. Even with that order limit in place, collectors raced to obtain the 2011 Proof Silver Eagles and ordered approximately 367,623 of them in the first six days alone. Sales then slowed to the point where only 407,991 had been ordered by the two week mark, at which time the Mint removed the household order limit. Each of these Eagles are struck as numismatic versions of the Mint’s extremely popular bullion Silver Eagle, of which millions are sold annually. However, whereas the bullion coins are produced as a means for investors to obtain small quantities of silver to add to their investment portfolios, the Proof Eagles are struck solely for collectors. Still, millions of the proof coins have been minted and sold since first introduced. They had been available annually until 2009 when the Mint was forced to cancel their production as it struggled to maintain an availability of the bullion Eagles which it was required by law at the time to do. The Proof Eagles returned to the Mint shelves in November 2010 and should once again be available annually even if bullion demand surges. A change in law allows the Mint to strike numismatic Eagles at the discretion of the Treasury Secretary. "a specialized minting process, which begins by manually feeding burnished coin blanks into presses fitted with special dies. The coin is struck multiple times so the softly frosted, yet detailed images seem to float above a mirror-like field. After scrutiny by white gloved inspectors, each American Eagle Proof Coin is sealed in a protective plastic capsule and mounted in a handsome satin-lined velvet presentation case with its own official Certificate of Authenticity." 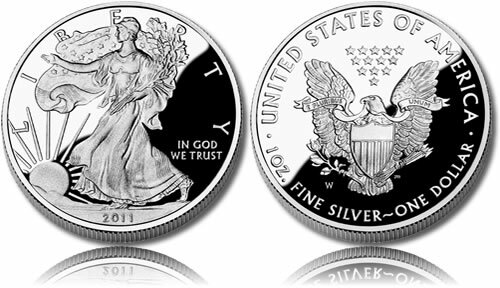 Adolph A. Weinman’s “Walking Liberty” design is featured on the obverse of each Silver Eagle. The design first appeared on a silver half dollar from 1916-1947 and is considered by many as one of the most beautiful to ever grace a coin of the United States. On the reverse, a heraldic eagle with shield is shown. It was designed by United States Mint sculptor/engraver John Mercanti. The designs have appeared on the Silver Eagles since first introduced in 1986. Along with the Proof Silver Eagles and the aforementioned bullion coins, the US Mint also typically strikes Uncirculated Silver Eagles. *Unaudited US Mint published figure.